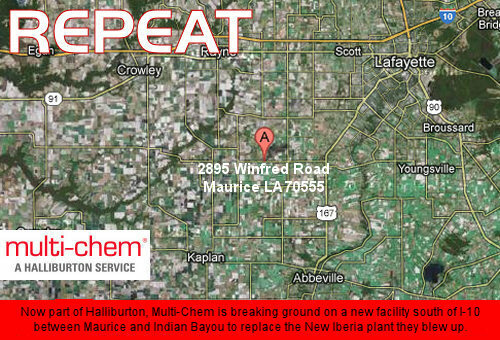 Last year Frac King Multi-Chem sold out to Halliburton after they blew up their own blending plant in New Iberia LA. Now over in Vermilion Parish, they’re breaking ground on their next Ground Zero. 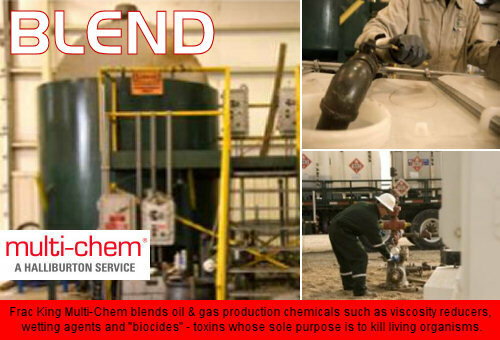 Frac King Multi-Chem blends oil & gas production chemicals such as viscosity reducers, wetting agents and “biocides” – toxins whose sole purpose is to kill living organisms. Multi-Chem describes itself as “the global leader in EGR” – where EGR stands for Enhanced Gas Recovery technologies such as hydraulic fracture stimulation, also called hydraulic fracturing, known and loathed by many of us as “fracking”, but referred to by dirty energy insiders as simply “frac”. Prior to its acquisition by Halliburton last October, being a frac specialist – with an extensive network of storage facilities and a fleet of frac trucks filled with ecosystem-destroying amalgams of toxic frac fluids and poisonous frac additives – made Multi-Chem one of the largest oil & gas production chemical companies in the world. Their “success” had little to do with any questionable claims they “Think Safety”. 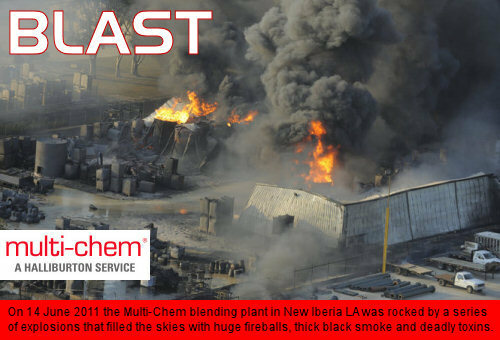 On 14 June 2011 the Multi-Chem blending plant in New Iberia LA was rocked by a series of explosions that filled the skies with huge fireballs, thick black smoke and deadly toxins. 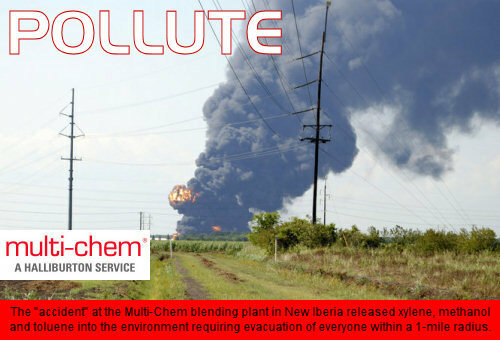 The “accident” at the Multi-Chem blending plant in New Iberia released xylene, methanol and toluene into the environment requiring evacuation of everyone within a 1-mile radius. Now part of Halliburton, Multi-Chem is breaking ground on a new facility south of I-10 between Maurice and Indian Bayou to replace the New Iberia plant they blew up. 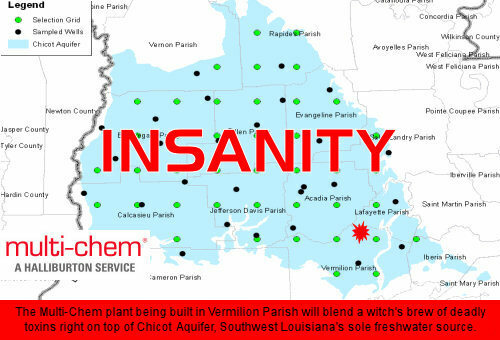 The Multi-Chem plant being built in Vermilion Parish will blend a witch’s brew of deadly toxins right on top of Chicot Aquifer, Southwest Louisiana’s sole freshwater source. Letting the same people do the same thing over and over again expecting different results is one definition of insanity, and nobody is aware of the implications here more so than mental health professional Marcella Manuel. She lives half a mile away from what could be Multi-Chem’s next Ground Zero, and is determined to evict them before their next toxic blending bungle forces her to evacuate. Ms. Manuel, a licensed practical counselor in Maurice LA, has founded Citizens Against Multi-Chem (citizensagainstmultichem@gmail.com) to alert environmental groups, warn those living in Vermilion, Acadia and Lafayette parishes of the imminent threats to their water supply and public safety, and organize an effective multi-front resistance. WHAT WAS THE COST OF 20 MULTI-CHEM JOBS IN DAMAGES AND LOSS TO NEW IBERIA? WHAT WILL IT BE FOR VERMILION PARISH? Like BP and Halliburton, in the ruthless pursuit of dirty energy and pollution profits Multi-Chem has already done irreparable harm to ecosystems in Louisiana, across America and around the globe. And in return for the now fleeting prospects of cheap gas and steady paychecks, we’ve let them get away with it for years. We must stop this insanity, and we must stop it NOW. If not us, then WHO? If not now, then WHEN? And if not for ourselves then for our grandchildren, who’ll be spitting on the toxic earth we’re buried in if we don’t. This document contains links shortened using http://tinyurl.com to facilitate emailing. If you are concerned that we would use them to cloak phishing or malware, you should open them with this: http://longurl.org. Also our thanks to the mobile web design, mobile web designer and mobile web developer who support our efforts. World War Web Advisory #8: Odrona The Indefinite Detainer Issues Internet Executive Order (#EPCF) Project Mayhem 2012: Re-Evolution Or New Age Ghost Dance?